While I was in Miami for the Winter Music Conference, I decided to make a last-minute side trip to Washington D.C. I can tell you right now, most people wouldn’t even attempt to do this at the last-minute. However, I missed my flight (Sorry @DivaTink) and I wasn’t ready to come back home yet. So, off I went to visit our nations capital. When I checked into my hotel (Hyatt Reston Town Center), I decided to check my surroundings and find some food. 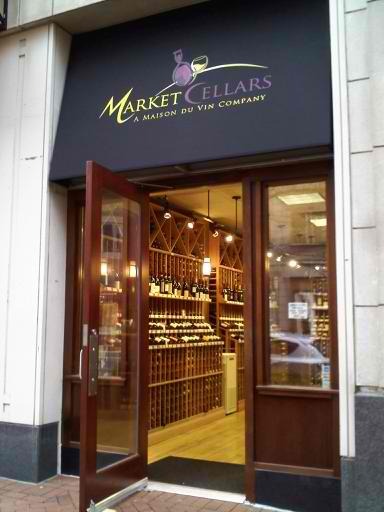 Just outside of the hotel was a nice wine shop, Market Cellars. Not knowing anything about Virginia wine, I decided to inquire inside. I met a really nice lady who works during the day at Market Cellars. She told me about some of the wineries in the area (just an hour away from Reston, VA) and the Virginia wines she carried. Although I didn’t have a car on this trip, I decided to take a map of the vineyards in Virginia for future reference. After touring around Reston Town Center and resting in my hotel, I decided to head back to Market Cellars to make a purchase. I walked in just as they were about to close and I met a really nice guy who worked in the evenings. We had a great conversation about the wine shop and I was pleased to hear that they carried a few Washington wines from Walla Walla and Red Mountain. Since I was focused on buying a Virginia wine, I decided to ask for a suggestion. The wine shop worker pointed me to a deal I could not pass up! The 2006 Northpoint Red Cellar Collection is the premier release of our Estate Red Blend. Grown exclusively on the 2 acre site of the Northpoint Vineyard, this proprietary Bordeaux style blend features a distinct and unique flavor representing the true terroir of this picturesque mountainous climate and soil. Steep, rocky, extremely well-drained soil, combined with aggressive viticulture practices, result in ripeness levels attained far beyond expectations for typical Virginia red wines. 42% Merlot shows through gloriously, characterizing full varietal expression of a grape that is usually left wanting in Virginia. Accompanied by 24% Cabernet Sauvignon, 20% Petit Verdot, and 14% Malbec. 2006 offered its challenges, specifically in terms of a defoliating frost in mid-October, which dropped all the vine’s leaves. But the terroir and viticulture associated with the Northpoint site produced exceptionally ripe grapes that were ready for harvest when the season came to a rapid halt. Unfined and unfiltered, some sediment may be in the bottle, occurring naturally. For best appreciation, a gentle decanting and aeration will provide optimum expression of flavor and body. Alex, I just found this blog from one of your Twitter posts! Great job! I’m glad to see that this is going well! Thanks mang! Hopefully I’ll see ya at one of the events or tours coming up.